American Drainage Systems was founded in 2000 for the sole reason to provide General Contractors and Site Owners with the best wick drain installation services available. We pride ourselves in going the extra mile each day, and are here to work proactively with Contractors and Inspectors to maximize production and minimize bottlenecks and waste in the construction process. American Drainage Systems has the best personnel and equipment available in the industry. Unlike other wick drain contractors, we pride ourselves on the least amount of downtime for equipment failures, and thus maximizing the amount of time spent installing vertical wick drain. American Drainage System has worked with over one hundred different General Contractors and Geotechnical Engineering firms, and are viewed with high regard in the industry. American Drainage System's team members have the experience of installing over 40 million LF of wick drain. Our experience includes Projects ranging from 10ft deep to in excess of 260ft deep. We’ve installed vertical wick drains under water, underneath bridges, inside of buildings, and on sites including Airports, Refineries, Tailings Ponds, Highways, Bridges, Airports, Utility Plants, Retail, Warehouses, Residential housing, Military installations etc. At American Drainage Systems we believe that the basis for a good project is the integration of the best construction planning, technology, equipment and personnel coupled with a culture based on Honesty, Work Ethic, and Quality. We strive to and consistently maintain a top notch level of integrity within the company and between Contractor and Client. Our goal at American Drainage Systems is to be the best wick drain contractor in the U.S. To achieve this we will stay on the cutting edge with our equipment and loyalty to our personnel and clientele. 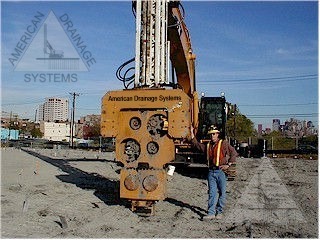 At American Drainage Systems, Inc. we pride ourselves on performing ordinary as well as extraordinary projects and correctly allocating resources and planning in order to make the jobs we do successful for both American Drainage Systems and the Client. We also offer to the Contractor, Owner, Geotechnical Engineer, etc. our expertise and knowledge of design, proper preparation, installation and completion techniques, with a goal of maximizing production for all parties and minimizing waste within the construction process.